On April 6, 2016, BCorp Europe gathered hundreds of inspiring and inspired entrepreneurs in Amsterdam to Celebrate the Changemakers. 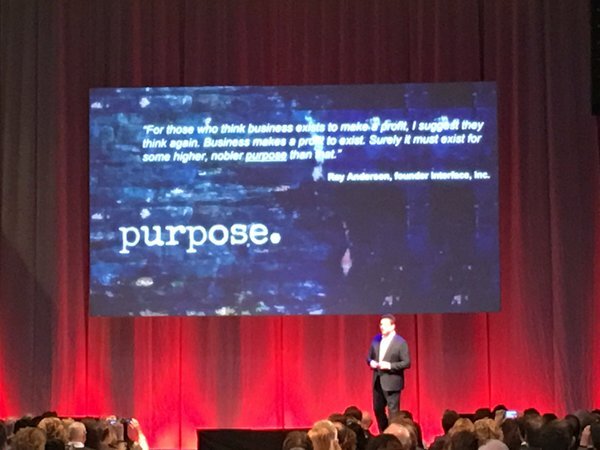 I was a bit ambivalent about an earlier BCorp event, but this event showed what the power of purpose and change is all about. The opening keynote was by Rob Boogaard, the CEO EMEA at carpet company Interface. We’ve all sat through shameless boasting sessions about the speaker’s company; this was refreshingly different. He was brutally honest and started from his conviction that sustainability cannot be reduced to soundbites, templates and business cases. There are no shortcuts and it’s hard work to figure out how to best integrate sustainability into your business. It takes patience and conviction. 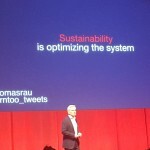 He shared his top ten ideas about the future of sustainability, and then illustrated these points with examples from his own company. In a series of inspiring B-talks, companies like Peer, Tony’s Chocolonely, dutch and Patagonia each shared their stories of conviction and purpose. And in the breaks there was ample time to explore the marketplace, where BCorps generously shared samples of their products. At the Patagonia booth, you could even exchange an old jacket (of any brand) for a second-hand Patagonia jacket. A great example of celebrating Worn Wear in our fast-fashion consumer culture. The closing keynote was architect Thomas Rau. To him, there was no future for sustainability, as it is limited to optimizing a system. Instead, he argued, we need to transform the system. And that transformation starts with transforming ourselves. To drive positive change, as people we need to agree to a few fundamental principles of our existence. Here are some of the principles he highlighted with beautiful pictures from outer space and amazing buildings he’d designed. He positioned reality is the sum of the permanent consequences of temporary beings. Even if we do not know the future, we do need to take options with the future, based on what we know. There is a role for schools to teach from a mindset of stewardship (rather than ownership), a role for governments to shift tax from labor to the limited resources, a role for architects and builders to create buildings that generate an energy surplus and that have a materials passport to be able to reuse them at the end of the building’s life. He’s so concerned about humanity wasting precious, non-renewable resources that in 2017 (70 years after the signing of the Declaration of Human Rights), he wants to launch the Declaration of Material Rights. To close the session, he left us with a role for all of us: to realize that technology is not the limiting factor. We are. And no BCorp community even would be complete without networking drinks. 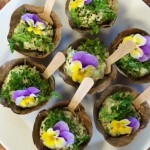 Excellent all vegetarian catering from Vuur+Vlam and ample drinks kept us talking for hours – to do just what the event’s title asked for: Celebrate the changemakers!